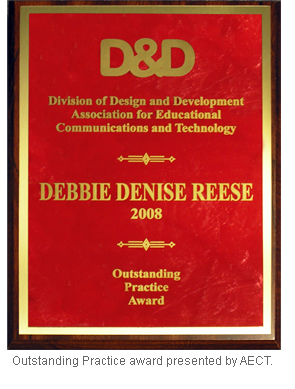 The Association for Educational Communications and Technology (AECT) has awarded its outstanding practice award to Dr. Debbie Denise Reese, senior educational researcher at the Center for Educational Technologies®. The award, from AECT's Division of Design and Development, recognizes Selene: A Lunar Construction GaME, the videogame developed by the NASA-sponsored Classroom of the Future at the center to study how students can best learn NASA science through videogames. The AECT award recognizes exemplary instructional materials or systems. Reese, the project leader, accepted the award and delivered three presentations on Selene design and embedded assessment of learning and flow at the AECT fall conference Nov. 4-8 in Orlando. One session featured her research paper, "Flowometer: Embedded Measurement of Learners' Flow Perceptions Within Game-based, Instructional Environments." She also presented a symposium proposing standards for instructional game design and assessment. She featured the CyGaMEs design and assessment as part of that session. CyGaMEs is the current National Science Foundation project that continues Reese's study of videogame learning. Her third presentation was at the awards session for the design and implementation of Selene.